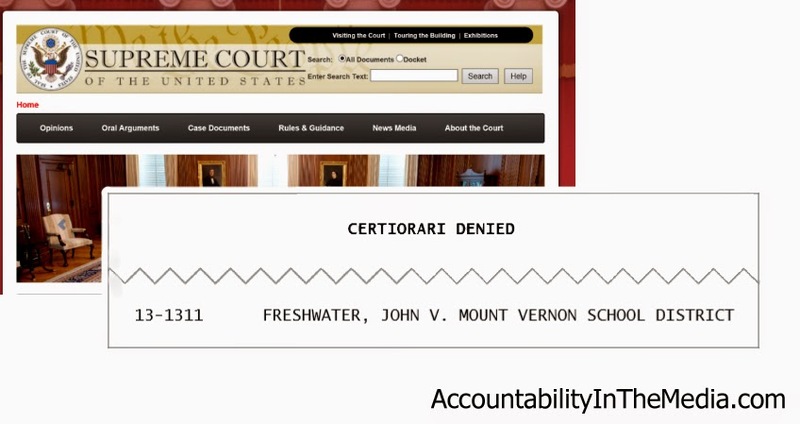 On Monday the U.S. Supreme Court denied John Freshwater's petition for certiorari. The unsigned order does not provide explanation or comment. "I am extremely disappointed," Freshwater's attorney Rita Dunaway told AccountabilityInTheMedia.com, "that the injustice done to Mr. Freshwater has been left standing. It is important, however, for people to understand that the High Court’s denial of certiorari does not in any way represent an endorsement of the conclusions reached by the majority of the Ohio Supreme Court." The Ohio Supreme Court found, in a 4-3 ruling, that the Mount Vernon Board of Education was justified in firing Freshwater from his job as a teacher at Mount Vernon City Schools. The sole ground for the court's ruling was that Freshwater was insubordinate for having two library books and a poster of George W. Bush in his classroom. The appeal to the U.S. Supreme Court was a hundred-to-one shot. According to Answers.com, "In 2009, the U.S. Supreme Court received 7,738 requests for case review, called a Petition for a Writ of Certiorari. Because the volume of cases is so high, and there are only nine Justices on the Court, only 1-2% (75-150 cases) of the submitted petitions are granted certiorari." Dr. Margie Bennett, president of the school board, told AccountabilityInTheMedia.com, "I hope that our school district and community may now finally lay this issue to rest and focus 100% of our attention on our students." The “Smith” of Britton Smith Peters & Kalail is attorney David Kane Smith. He is representing the Mount Vernon Board of Education in the case Freshwater v. Mt. Vernon City School Dist. Bd. Of Edn. The case is an appeal of the firing of science teacher John Freshwater. Earlier, the Ohio Supreme Court upheld the firing, in a 4-3 vote, on the sole ground that Freshwater was insubordinate for having two library books and a poster of George W. Bush in his classroom. Later this year, the United States Supreme Court will decide whether to hear the case. AccountabilityInTheMedia.com: In the brief you discussed at length the issue of academic freedom, citing various related court cases but without mentioning board policy 3218. On page 22 you wrote, "The academic freedom Freshwater tries to appropriate belongs to the District, not to him." Is it the position of the Mount Vernon Board of Education that board policy 3218, "Academic Freedom of Teachers," does not give teachers within the Mount Vernon City School District academic freedom? David Kane Smith: No response. AccountabilityInTheMedia.com: Regarding Freshwater's 2003 proposal titled "Objective Origins Science Policy," you wrote that "the Board pointedly rejected" the proposal. In what way was the rejection done such that it was "pointedly"? Did the board in 2003 document any criticism it had that formed the basis of the rejection? AccountabilityInTheMedia.com: The Science Curriculum Committee reviewed Freshwater's 2003 proposal and submitted a letter to the board in which they listed their reasons for not supporting the proposal. Was the committee incorrect when it stated "Proposed mentioned critical thinking skills--redundant, we're already doing this. […] The board of education policy addresses controversial issues--Freshwater proposal is already addressed"? AccountabilityInTheMedia.com: When you wrote about Freshwater's 2003 proposal, you characterized it as being a "proposal to teach creationism." As you are likely aware, the proposal does not directly mention creationism or even intelligent design. Upon what do you base your claim that the proposal was to teach creationism? If the proposal had been written and submitted by an atheist would you still describe it as a proposal to teach creationism? AccountabilityInTheMedia.com: When you discussed the issue of the poster of George W. Bush and his cabinet you emphasized the quote, James 5:16, at the top of the poster. Is the board's claim of insubordination regarding the poster dependent upon the quote being on the poster? If yes, was it also necessary for the quote to be visible for it to be insubordination? AccountabilityInTheMedia.com: Regarding the issue of the books in Freshwater's classroom, you argued that Freshwater having on a lab table the two library books The Oxford Bible and "Jesus of Nazareth" constituted insubordination. As you are likely aware, Ohio Supreme Court Justice Paul E. Pfeifer raised some questions about the issue of the library books. The following questions are borrowed or adapted from those raised by Pfeifer: What work rule or order did Freshwater violate by checking out books from the library? Was there a work rule in effect that a teacher could not borrow books from the school library and keep them in his work area? Do you really mean to say that books of a religious nature are acceptable in the library but not acceptable to be checked out from the library? Or is it only practicing Christians who cannot borrow such books from the library? AccountabilityInTheMedia.com: In your brief you criticized Freshwater's attorney for not mentioning the allegation made by James Stockdale regarding comments he claimed to have heard in Freshwater's classroom in the fall of 2006. 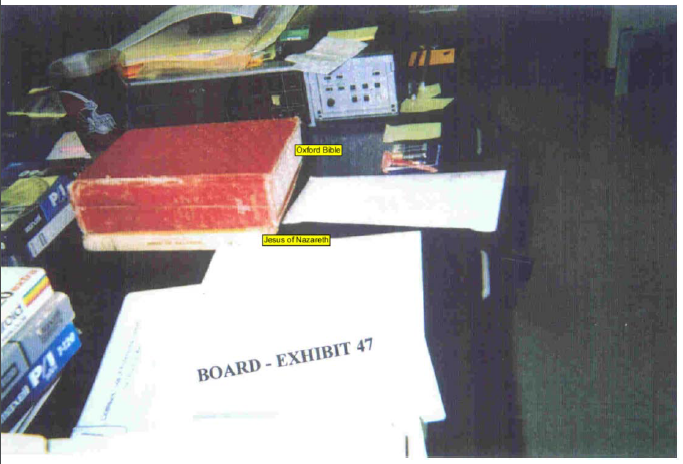 As you are likely aware, as a result of a public records request made by AccountabilityInTheMedia.com, it was discovered that the school's records show Stockdale's duties did not take him into Freshwater’s classroom anytime Sept. 1, 2005 through June 30, 2008. Do you feel you deserve any criticism for not informing the U.S. Supreme Court that your witness, according to your own client's records, was not even in the classroom during the time period he testified about? AccountabilityInTheMedia.com: As part of what you characterized on page 13 of your brief as "unfavorable facts," you stated "the referee found that Freshwater distributed religious handouts […] ." The handout you specifically cited was “Darwin’s Theory of Evolution—The Premise and the Problem." What about the handout makes it religious? Is it the position of the board that a handout is religious merely for critiquing aspects of Darwin's ideas about evolution? Or is it the position of the board that such a handout is religious only if the board believes it was written by someone who is religious? AccountabilityInTheMedia.com: Regarding the handouts, you went on to say the referee found that Freshwater "then collected them covertly when class ended." Does the school have a policy or work rule that prohibits the environmentally friendly practice of collecting and reusing class handouts? Further, how does a teacher "covertly" collect handouts? AccountabilityInTheMedia.com: You sprinkled your brief with remarks claiming that Freshwater "disparaged" and "discredited" science and that he "taught his students to doubt science" and sowed "seeds of doubt and confusion." As you are likely aware, the scientific method involves asking questions and testing knowledge claims. As you are also likely aware, the district's approved science textbooks for the eighth grade record examples of how scientists have changed their views on some things throughout the years and even mention some of the non-scientific views previously held by people. Is it the position of the board that an eighth-grade science teacher is not permitted to let students know that scientists have changed some of their views? Is it also the position of the board that an eighth-grade science teacher is not permitted to encourage students to use critical thinking when learning about science? AccountabilityInTheMedia.com: You stated in your brief that Freshwater's "story changes with every new appeal." One aspect of the case to which you applied this characterization was how Freshwater has described his handling of the topic of origins. The explanation you offered depended upon Freshwater having "denied questioning evolution." However, the citation you included does not use the word "questioning" or any form of that word. In the included citation Freshwater merely states that he "denies that he taught either Creationism or Intelligent Design." Does the board not make a distinction between "questioning evolution" and "teaching creationism"? Also, does the board not make a distinction between "teaching creationism" and "discussing" or "considering" creationism? AccountabilityInTheMedia.com: You stated in your brief that the U.S. Supreme Court lacks jurisdiction over this case and that this is "the appeal's fatal flaw." Specifically, you referenced 28 U.S.C. § 1257(a). As you are likely aware, 28 U.S.C. § 1257(a) states, in part, "Final judgments or decrees rendered by the highest court of a state […] may be reviewed by the Supreme Court… where any title, right, privilege, or immunity is specially set up or claimed under the Constitution […] ." Is it the position of the board that Freshwater has not claimed in his appeal any right under the Constitution? (PDF) School board brief in opposition to review of Freshwater v. Mt. Vernon City School Dist. Bd. Of Edn. (PDF) “Darwin’s Theory of Evolution—The Premise and the Problem"
John Freshwater’s attorney Rita Dunaway has petitioned the U.S. Supreme Court to review the firing of Freshwater from his job at Mount Vernon City Schools. “Whether firing a public school teacher for checking out and possessing school library books as a form of passive protest violates the First Amendment. Freshwater had two library books in his classroom: The Oxford Bible and "Jesus of Nazareth." The Ohio Supreme Court earlier upheld the firing in a 4-3 vote. Six out of the seven judges did agree that it was unconstitutional for the school to order the removal of Freshwater’s personal Bible. The only reasons the court gave for upholding the firing were that Freshwater had two library books in his classroom and that he had a poster of George W. Bush. The court sidestepped the issue of how Freshwater handled the subject of evolution. AccountabilityInTheMedia.com is awaiting a response from the school. (PDF) Petition to U.S. Supreme Court to review Freshwater v. Mt. Vernon City School Dist. Bd. Of Edn.